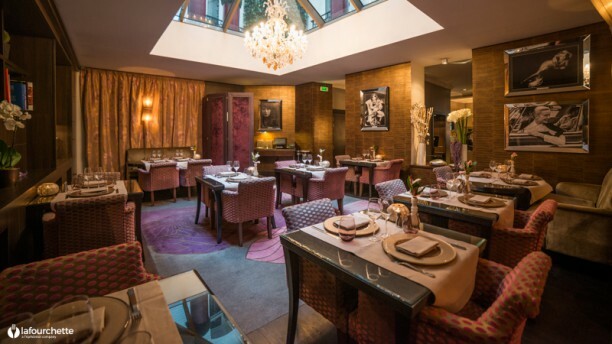 "Restaurant of the Hotel Champs Elysées Plaza, a magnificent 5-star hotel, the Keller reveals its chic and cozy atmosphere to you. Its glass bathes the room with soft light while the predominant wood gives warmth to the place. The chef will delight you with refined cuisine. Enjoy in particular, the Homard Bleu Breton and its new vegetable casserole, then end on a sweet note with the famous Fraisier by Carl Marletti. An ideal location both for intimate dinners and business meals." Excellent personal attendance. Small and cozy. Ideal for a private dining event. The description led me to think that it was a keller - that is, a place somehow in the underground, like a wine cellar. But it was just a common hotel restaurant. Receptionist and waiter were excellent, very polite and helpful. The wine list is rather good, with varied price options. Atmosphere is modern/romantic. The dishes had nothing extraordinary, and I ended up thinking it was too expensive for what it offered. We loved everything. It was quaint and everything was wonderful. Service was outstanding. I’m so thankful we decided to go there for dinner. Le Keller is a small dining room with a reasonable menu at a reasonable price. While the service was EXCELLANT, we felt the food options could have been better. Excellent tastes, small portions, rather expensive given the discount of The Fork! Le jeune Chef Thierry Motsch regorge de talent ! c'était du top chef !!!!! my steak was excellent. my wife & daughter did not like their fish. the deserts were very good. Great place, nice and romantic, had a great time. Repas très agréable dans une ambiance calme, feutrée et romantique. J'ai seulement regretté que le dessert que j'ai pris soit à mon sens, moins abouti que les autres plats proposés. Nouvelle carte très réussie ! Nous avons découvert les nouvelles saveurs avec grand plaisir ; Bravo ! Les ravioles de homards étaient excellents, tout comme la canette. Les dessert étaient moins maîtrisés et inventifs. Nous avons trouvé le restaurant un peu petit. Excellente surprise ! très bien situé avec un accueil rare. Attentive, friendly and knowledgeable staff. Good, beautifully presented food. There were no other guests at the restaurant, so it may be one of Paris' best kept secrets. Excellent repas.Bon service.Cadre assez relax.